It's kitten season. Stray cat carers in Malta are very busy these days. 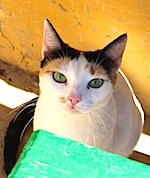 Many kittens have been born all over the Islands - often as a result of careless pet owners who have abandoned their un-spayed cats and un-neutered tomcats in the streets. 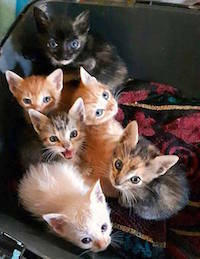 Those litters land on the doorsteps of the carers, with the mother-cat in distress, or in a worst case run over by a car. However, there are many good souls in networks of foster caregivers who raise the little ones, while the mother, along with other youngsters, are being trapped for sterilisation. Recently we noticed a bunch of young cats in the colony opposite of the house where we live, ready to procreate. In agreement with their feeder, we were able to arrange for a dedicated volunteer to trap the felines and have them neutered by a non-government animal organisation's vets. Meanwhile the cats are back in their colony, happily minding their cat business, thanks to another soul with a big heart for stray animals. Update on «Islands of Cats» - the photo-story book that highlights the dedication and devotion of stray cat carers in the Maltese Islands. All stories have been written, all 222 photos selected, layout has been finalised, and thanks to our contributors from our crowdfunding activity in February and March, the 20'000 English words have been translated to Maltese and German. We strive to pre-release «Islands of Cats» as ebook within the next couple of weeks, while the hardcover edition is still pending funds. "Hello, I stray in Gozo." Help us to help the stray cats carers. We are still looking for start-up support for the printing of the first 1000 hardcovers. Your contribution is very welcome, also sponsorship » click here. Please like our page on Facebook, follow us on Twitter, and regularly visit this blog. Thank you so much for your time and consideration, and stay tuned for more. For today, our best wishes to all (cat) mothers !